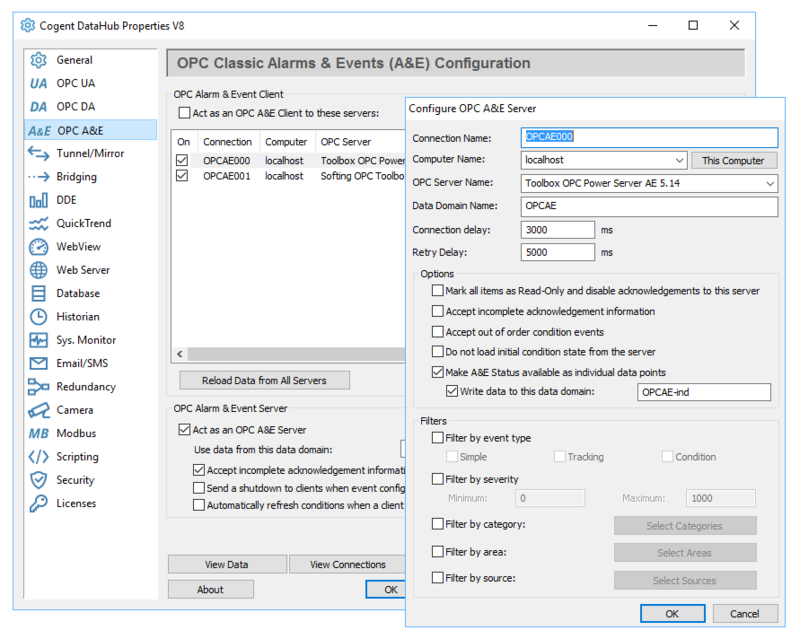 OPC Alarms and Events (Classic), or OPC A&E, protocol from the OPC Foundation provides a way to track, report, and acknowledge alarms and events in a Windows system. The Cogent DataHub can act as both an OPC A&E server and client program at the same time. This means it can read from multiple OPC A&E servers (while acting as a client) and make this data available to any number of OPC A&E client programs (while acting as a server). Note: the DataHub cannot be configured to act as a source for generating alarms and events, but if it is configured as an OPC A&E client, it can pass along A&E values. This is useful for tunnelling A&E data, converting A&E data to OPC DA or OPC UA data, and allowing OPC DA or UA clients to interact with and display data from OPC A&E servers. Connect any number of OPC A&E servers or clients. Tunnel OPC A&E across a network. Convert OPC A&E to OPC DA or OPC UA. Connect OPC A&E servers to any SQL database. Display data from OPC A&E in a web-based HMI. Connect OPC A&E to Excel spreadsheets. Send emails based on data from OPC A&E. The OPC A&E protocol can be added to any license pack.